There was only one train a day out of Abaza, it left at 10:45pm and arrived in Abakan a whole 180km away at 8am the next day. Admittedly the train was stationary for almost half the time, but it was still jolly slow. No matter though, thanks to the wonders of platzcart we slept most of the time. From Abakan we were overjoyed to find that there was a direct train to Irkutsk, but then we found that it consisted of a single coupe carriage that could not accomodate bicycles. So we had to go to Krasnoyarsk and then get another train from there to Irkutsk. The train we caught to Irkutsk was already mostly full and we had not been given a seat reservation so we had to muscle our way on and create enough space for our bikes and gear. I think we initially caused some annoyance (it's hard to be as polite as one would wish when struggling with the language) but soon everyone was friends again. We reached Irkutsk 60 hours after leaving Abaza having spent three fairly comfortable nights on the trains. Luckily we always changed train during the day and the weather was sunny so sitting around on the platforms eating ice cream (only 10p each - do they tax them or something in Britain?) was quite pleasant. 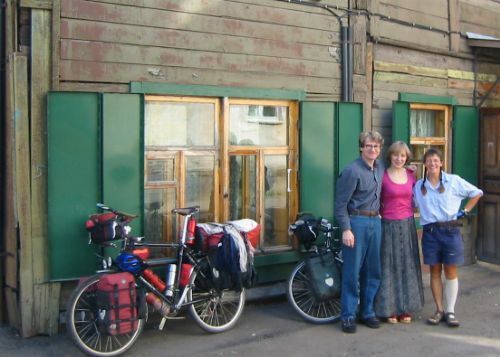 Once in Irkutsk we folllowed a lead given to us by Nathaly of www.transsiberiancyclechallenge.com to a lady who let rooms in her house and another apartment she owned. We found it to be very good, $15 a night per person including breakfast and an evening meal. The address is Apartment 1, Block 35, Ulitsa 5-Armii, Irkutsk, 664000. Tel (3952) 330493, email fujazz@mail.ru. The owner is Galina Bolshedvorova, she speaks German and her husband speaks English. Best of all the bathroom contained a heated towel rack that could have been purpose designed for drying a washed duvet jacket on. You should have seen the dirt in it after ten years use without cleaning! Then we set of for the Mongolian Consulate, only to find it was shut on Wednesdays (opens 9:30 - 12:30 and 14:30 - 17:00 every other day of the week). Instead we went gear shop hunting and then gear shopping. We needed extra clothes in preparation for the cold of Mongolia and to replace ones that were wearing out, plus various bike parts. Proper outdoor clothing proved to be available but every bit as expensive as back home. We both spent nearly $100 on pairs of trousers and I got new SPD boots. I had a busy afternoon when I sheared the head off one of the bolts holding my front rack on. The bolt had deformed and got stuck in the threaded boss in the frame. I took the bike to a car repair place by the Fortuna market and they kindly drilled out the remains of the bolt and re-tapped the hole. The daft thing was that the only tools of theirs we used were the drill and a hammer, everything else, drill bits, tap and even a centre punch, I had to buy from the market for them!